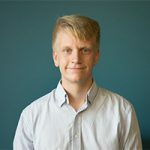 CUW’s Computer Science department has strived and succeeded in being at the forefront of using innovative current technology to help students advance their understanding of computer science and its principles. Aside from being undoubtedly cool, these gadgets are a fantastic learning opportunity for CS students. Here are just nine pieces of technology that CUW students get to interact with on a regular basis. The Ozobot is one of the more diminutive devices found in the computer science wing of the building, but foundational for teaching students programming. 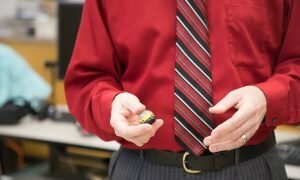 This little guy can drive itself around, detecting lines and colors on its merry way according to what it’s programmed to do. It operates hand in hand with computer coding skills that are learned within the classroom. 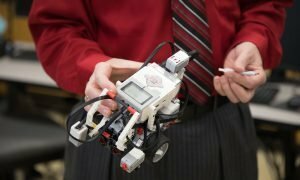 Another tool used to teach CUW computer science students is the collection of Lego Mindstorm robots and the components users assemble to give them life. Students can build their own and learn about the different functions of robots and the tasks they can complete with unique construction. These Lego sets have become commonplace in the tech world and often are used in local and national competitions for creating the most intuitive robot. The Nao Humanoid Robot is, well, distinctly human-like. He has joint articulation, bipedal movement, and basic communication skills like you or I. 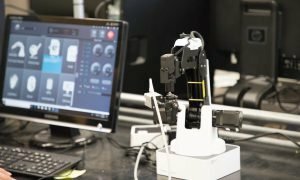 Computer Science owns a model and often uses it to teach how it works and what the future is like for robots that can complete human tasks. Don’t worry, he is really friendly, and quite docile. Nao, if you’re reading this, please don’t take my job. 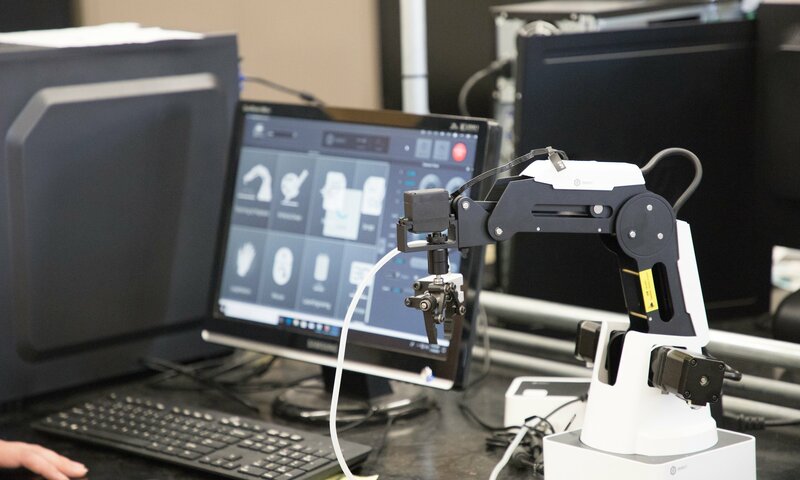 The Robotic Arm standing proudly in the CS lab has many impressive functions and is an excellent model for machinery that can be used for industrial purposes. 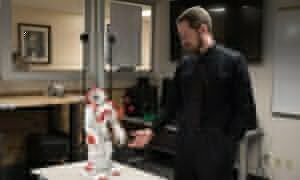 It can pick up and move objects either with its robotic hand or via vacuum suction. With other special attachments, it can even 3D print in open space or perform laser engraving. Talk about a helping hand! 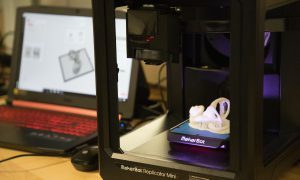 CUW owns five different 3D printers accessible to CS students. All are capable of creating an endless number of objects using different types of filament. One special printer uses liquid resin to form objects by using a synthetic liquid that is solidified by a UV light projector, curing the resin layer by layer. Another features carbon fiber as a medium to build complex objects. I witnessed one of these printers fabricating a detailed model of the ear that could be used to study for health professions classes. You may be aware that self-driving cars are already a reality and on our roads. 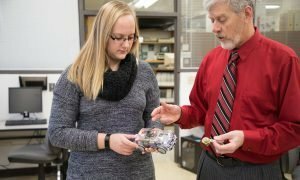 It is a relevant topic of study that CUW students can learn via our models of autonomous vehicles. When left to their own devices (see what I did there?) the models can navigate corners and sense objects in their path by various sensors housed in the cars body. Have you ever seen Star Trek? 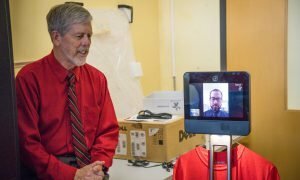 Well, the Beam Telepresence Device has brought us closer to that world. It functions as a video communication device that can move along with its user, also using the principles of autonomous movement. This technology has proved helpful for people with disabilities limiting their ability to walk. It can connect with other telepresence devices or other screens to allow one to view their environment remotely. The technology could very well be used in the near future to help in retail stores and other places of work. I would not have believed there was such a thing as a functional computer the size of a credit card until I saw one in the CS lab. In a compact space, it contains all of the major components and miniature hardware that allows one to do computing tasks. Just simply connect it to a monitor and it works. If developed it could be an affordable alternative to a normal desktop computer. 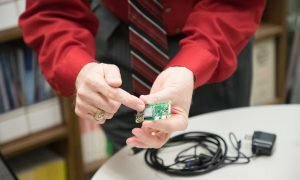 Furthermore, it helps students understand the parts of a computer and how it operates. This is yet another piece that contributes to Concordia’s knowledge of modern technology. 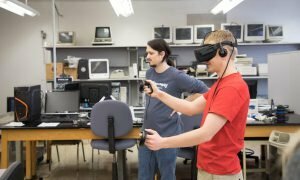 CUW’s VR system is as complete as they come. It features endless capabilities of viewing a digital world and interacting with virtual surroundings. VR has been used for many purposes already and has promising implications for how it can be used in the future. The system allows one to create virtual sculptures that can be used as models for designs in the real world. There is technology in its early phases that allows sports fans to experience 360 degree views of live games. It can give a vivid view of other worlds that cannot be found elsewhere. CUW itself has been interacting closely with experts modelling different settings of the Bible in its respective time. The systems of VR in our CS lab help students learn about a subject that has seemingly no limits for advancing the world of technology.